Between sophomore and junior year of college, backpacking around Europe with my friend, we stopped into a wine store in Paris and asked, in our best and most polite French, for a bottle of something "cheap, yet drinkable." The owner treated us very seriously, discussing the relative merits of bottles for 15 or 20 francs (about $2-3, at the time, before euros existed). "This one has a light finish of citrus. That one has a soupçon of red berries and black pepper." Well, 30 years later, not that much has changed, especially when it comes to the rosés of summer. They come bursting forth in the late spring, like a field of wild flowers, in grocery and wine stores everywhere. And many of them are, still, the equivalent of $2. 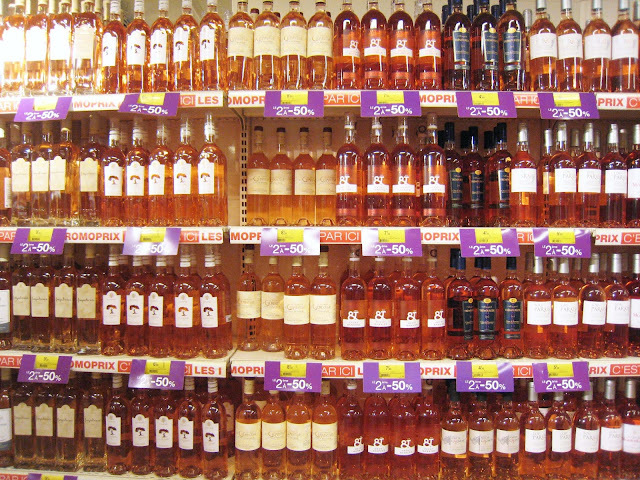 It's astonishing, really, how many rosé choices there are, and how cheap they are. And, frankly, how respected they are. Rosé is a totally respectable, legitimate choice not only on the sunny terrace of your Provence villa (where it's practically de rigueur and flows cheaper than water) but even with your café meal in Paris. Your waiter will not look down his nose at you for ordering a rosé (whether he looks down his nose at you for other reasons remains to be seen), and especially if you are ordering something that is on the light, summery side. As with all wines, a rosé can run the gamut from very cheap to very expensive. However, when I say rosé flows cheaper than water, I'm not entirely exaggerating. 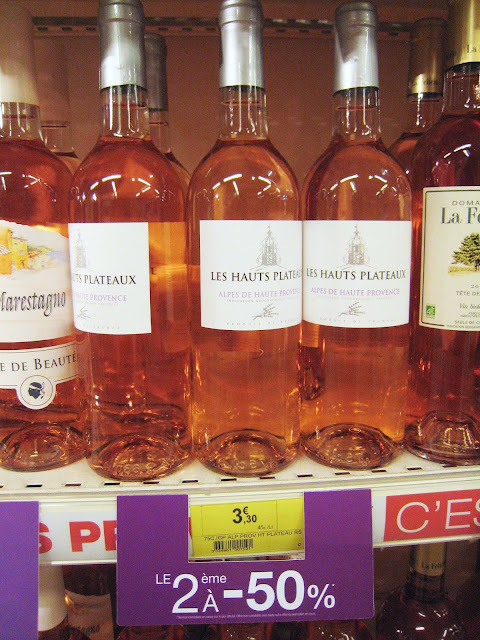 The rosé below -- not even necessarily the cheapest on the Monoprix shelves (I didn't look that carefully) -- is 3,30€ (that's 3.3€, or about $3.50) for a bottle, but the second one is half price. That's less than 2.5€ per bottle in the end, and I know I've paid more for a small, plastic water bottle than that, especially in tourist spots. Brebidoux is a lactic, raw sheeps' milk cheese made in the Alpes de Haute Provence, in the combined region of Provence-Alpes-Cote d'Azur. It's a thick disk of a cheese that is, like it's name suggests, a sweet, mellow, soft (all meanings for the word "doux") sheep cheese ("brebis"). The milk comes from a variety of sheep breeds raised organically: Laucane, Brigasque, Thônes, and Marthod. Brebidoux is a farmhouse cheese, meaning, in this case, you may need to ﻿get yourself to the Gipière farm in the village of Cruis to buy some, or to some local markets, in particular during the spring and early summer. It's awfully hard to find outside of the region, unless you've got friends who know you are cheese-obsessed and bring you back a nubbin to Paris. The texture is silken, sticky, and creamy, with a fine crust. As the name suggests, it's a mild (doux) cheese, without the heavy gamy, farmy flavors of some sheep cheeses. The flavor of the milk sugars really shines through, with mellow floral undertones. The bargain rosé pictured, Les Hauts Plateaux, comes from the Alpes de Haute Provence, as does Brebidoux. Not only are they from the same area, they go together like...well...cheese and wine. That is to say, they pair beautifully, when they both show up in the spring. Rosé is often eaten with goat and sheep cheeses, in particular, and that's not a coincidence: both rosés and goat/sheep cheeses are traditional southern French specialties that share terroire, a peak in spring, and often a place at the table.